This image offers an excellent example of Orphism, the expressive combination of color and form that dominated much of her career. The row of dancers spread out under dome lights positively bursts with patches of vibrant primary and secondary colors, illustrating her interest in the simultaneous color theory espoused by mid-19th century chemist Chevreuil. This theory explored the visual effect of combining a primary color with a secondary; a technical discovery that enabled artists to intensify the colors of their creations solely by manipulating the placement of color on the canvas, without consideration to subject matter. Twelve feet long, this painting was the largest of four versions and the first work exploring contrasting colors (blues and oranges, for example, placed side by side for maximum intensity) on such a large-scale. The Bal Bullier dance hall on the boulevard Saint-Michel in Paris was a gathering place for avant-garde literary and art figures as well as students. Sonia and Robert were frequent attendees and there is no question that her depiction was inspired by her own experience. Le Bal Bullier exemplified Orphism perfectly by allowing the placement of color on the canvas to create both movement and energy. The bodies of the dancers are broken into abstract areas of bright color, which cause a kind of flickering reaction in the viewer, forcing him to work his way across the canvas and take in the spectacle described. To maximize this effect Delaunay sets the dancers against a background where color is treated in just the same way, a red next to a green, a yellow next to a purple-blue, perfectly capturing the excitement and energy of this famous dance hall. Although there is no attempt to present the world inside the hall with precision or photographic reality, the experience of those dancers under the bright lights, swirling around in couples, or as individuals, is absolutely captured. Delaunay's passion for exploring the way complementary colors (one primary with one secondary) reacted to one another, was not contained to fine art. In fact, she boldly applied this expressive technique to areas in which artistic exploration was formerly not noted, such as the world of fashion and home décor. 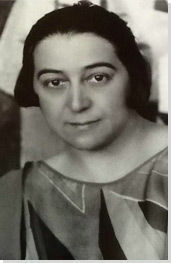 She eventually built a career on designing fashions for dresses, driving caps, swimsuits, shoes, and scarves. This dress is of particular importance because it was one of the earliest examples of her unique "simultaneous" dresses. The dress is created by sewing together oddly shaped pieces of fabric in non-uniform size and color. The color scheme, similar to one she developed in her paintings, manages to encapsulate a full range, including all the primaries (red, blue, and yellow) and secondaries (green, orange, and purple). Black, noted in the bunched fabric that wraps around the back and the collar, is used to contain the explosion of color. The artist designed this type of dress for her friends, most certainly enhancing the visual effect of the dancers at the Bal Bullier. Delaunay's long-format illustration of Blaise Cendrars' poem La prose du Transsibérien et de la Petite Jehanne de France (Prose of the Trans-Siberian and of Little Jehanne of France) can be considered a "simultaneous book." Describing the poet's 1905 journey on the Trans-Siberian Railway with Jeanne, a French prostitute, the two-meter long book, pleated in the manner of an accordion, exhibits the artist's technique of manipulating color for maximum expression. Patches of non-uniformly shaped color and text printed in different colors (not the expected black) and typefaces, guide the reader around the text and reflect the mood and content of Cendrars' poem. The planned print run of 150 copies was purposefully meant to reach 300 feet high (if all copies are connected end-to-end) - the height of the Eiffel Tower. A celebration of color, Sonia Delaunay's painting Prismes électriques is focused around two large overlapping circles created by arcs or curved forms of primary and secondary colors placed one beside the other. The remainder of the canvas is covered by other areas of color noted in a variety of shapes both geometric, such as arcs, rectangles, and oval-like shapes, more abstract and all connected as if sewn together like a tapestry. This work also exemplifies the way that life influenced Delaunay's art. Apparently she and Robert were walking down the boulevard Saint-Michel when they came upon newly installed electric lamplights. Both artists tried to recreate the impressive glow from these new inventions in their artwork. In this painting we see how Sonia tried to replicate the way these artificial lights cast colors onto the sidewalk beneath with by sketching rapid, semi-circular colored lines. Sonia's efforts elucidates Chevreuil's claim that the manipulation of color can produce light on the canvas; that the combination of two colors can create a brighter effect or alternatively, a darker one. Delaunay's Robes simultanées (trois femmes, forms, couleurs) (1925) depicts three dressed mannequin-like, featureless forms. The figure on the left wears a dress comprised of interlocking rows of blue and white triangles; the middle figure's dress has a pattern of lines that bend at right angles, creating rectangular shapes on the bodice and skirt of the dress while leaving a rust-red colored square in the place of a belt buckle. The left figure wears a black dress with a ruffled skirt that creates a jagged silhouette. Delaunay's colors are earth tones as well as primaries. The figures stand on a blue carpet with a red-lined border in front of a trifold dressing screen wherein each panel has a different color scheme (three to reflect the number of mannequins depicted). Delaunay's career went well beyond the visual arts, including the design of interior decor, fashion, and fabric. This work directly refers to her activity as a fashion designer, showing the way that these arts intersect: art inspiring fashion and fashion inspiring art. The intersection between art and design can be noted in her work on Casa Sonia (1918), the set and costume design of Tristan Tzara's Le Cœur à Gaz (1923) and her textiles, which sold worldwide. Design 1044 illustrates Delaunay's work in textile design. This light cotton fabric pattern is composed of overlapping oblong shapes of varying widths in shades of blue and green, broken up here and there with a pale yellow. The shapes are outlined in white, allowing the original color of the cloth to show through, and the overall pattern resembles the petals of a flower. Textile design was an important aspect of Delaunay's career. 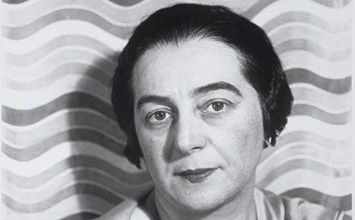 Although she had already designed and sold fabrics of her own design in 1925 when she met Joseph de Leeuw, owner and director of the Holland based department store Metz & Co., the friendship quickly developed into a business collaboration resulting in hundreds of fabric designs and lasting through the 1950s. Delaunay would produce designs, such as this one, in a number of different color combinations; beyond the present one there is a version in red and orange palette, another in blue and purple, and one in brown and tan. Delaunay's work in this field elevated the field of fabric design to high art. This large-scale painting measures almost twenty-three feet long and ten feet high and features a three-blade propeller anchored by a series of circles of various bands of color. Surrounding the propeller are depictions of mechanisms including gears and levers, metal disks, and wires in bright colors that project from a blue background composed of other, fainter, painted circles. This painting is one of a series that Sonia Delaunay made for the Exposition Internationale des Arts et Techniques dans la Vie Moderne, an international exposition that took place in Paris in 1937. The commission marked her return to painting, garnered her a great deal of attention, and secured her financial security. Delaunay exhibited this work in the air travel pavilion alongside others she prepared on the same theme. The artist also created two works for the pavilion devoted to railroads, altogether creating a body of work celebrating the major advancements in transportation that had been made in recent years. Although focusing on the element important to the theme, in this case the propeller of a plane, Delaunay's passion for color and shape is apparent in this work: the mechanisms are rendered in vibrant shades, unlike those found in real life, on a background of colorful circles. Delaunay's Rythme (Rhythm) is of particular importance because it was created for and exhibited at the 15th annual Salon des Tuileries exhibit in Paris in 1938. The artist's participation in this exhibit proved her inclusion within a group of artists representing modern art in France. This large-scale painting measures more than seventeen by nineteen feet and, like her other works, features circles of bright primary colors as well as black and white. Layers of semi-circle arcs are unevenly positioned one beside the other, forming a line of disjointed circles along a central axis. A section of interlocking black and white triangles ground this series of half-circles on one side, connecting with the black of the large circle surrounding the colorful central shape to create a balance across the canvas. Beginning in the 1930s Delaunay began to explore the subject of "rhythms." She was fascinated by the rhythm created by placing colors side by side, complementing and contradicting one another. As can be seen in this image, sometimes the colors blend together and make a larger shape (as with the circles on the top center of the canvas) while other times they work against each other (noted in the way some of the circles on the lower half of the canvas seem to break apart from each other). Delaunay captures the visual rhythm created by the moving or shifting of colors, as well as their interplay across the canvas. The artist described the process she underwent in exploring color as a "period of scales to discover harmonies and dissonances that give colors a life of their own, investing them with a pulse and vibrations which, when later put in order, become rhythms." Here the canvas is clearly split into two sections. The left third of the canvas is filled with the familiar motif of multi-colored, semi-circular arcs lined up one beside the other to form layers of circles. The remaining two thirds are filled primarily with vertical rectangles of varying sizes and colors. The artist leaves faint traces of the circle shapes (a continuation of one yellow and then white arc that extends into this side from the left section of the canvas and then seems to fade into the rectangles) as well as a thick bold black semi-circle positioned within a white rectangle in the center, to provide almost an anchor for the rhythm of the various areas. Thirty years after her first exploration of colored rhythm painting, there is a new development of geometric shape in her work. The rectangular shapes diminish the fluidity of the circular shapes. This change indicates the way she continued to explore her fascination with this theme throughout her career. As she wrote, "For me, the abstract and the sensual should come together. Breaking away from the descriptive line did not mean becoming sterile."